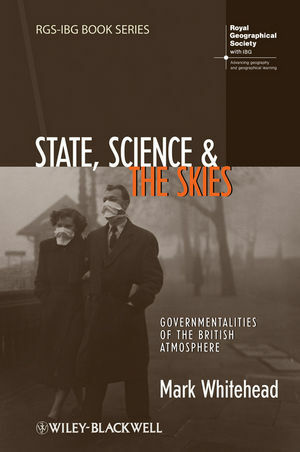 Utilizing environmental archival materials from the UK, State, Science and the Skies presents a groundbreaking historical account of the development of a state science of atmospheric pollution. Mark Whitehead is a Senior Lecturer in Human Geography at the Institute of Geography and Earth Sciences, Aberystwyth University; and Senior Research Fellow at the City Institute, York University, Toronto. His published works include Spaces of Sustainability: Geographical Perspectives on the Sustainable Society (2006); and The Nature of the State: Excavating the Political Ecologies of the Modern State (co-author, 2007). 1 Introduction: Space, History and the Governing of Air Pollution. 2 Historical Geographies of Science and Government: Exploring the Apparatus of Atmospheric Knowledge Acquisition. 3 Science, Sight and the Optics of Air Government. 4 Governing Air Conduct: Exhibition, Examination and the Cultivation of the Atmospheric Self. 5 Instrumentation and the Sites of Atmospheric Monitoring. 6 A National Census of the Air: Spatial Science, Calculation and the Geo-Coding of the Atmosphere. 7 Automating the Air: Atmospheric Simulations and Digital Beings. 8 Environmental Governmentalities and the Ecological Coding of the British Atmosphere. 9 Conclusion: Learning Like a State in an Age of Atmospheric Change.